If you'd like to join me in person or via Facebook or YouTube on Saturday 29th September for my launch event have a look at what I have planned here - I'm visiting four locations in Fife: 0930 Dalgety Bay, 1130 Aberdour, 1330 Burntisland and 1530 Kirkcaldy. There's over 10 different coaching tools shared in the book to help you get on track if any of these sayings are curtailing or dampening progress you're making in your life. Here's an overview of the book and process I published when the US edition was published last month. 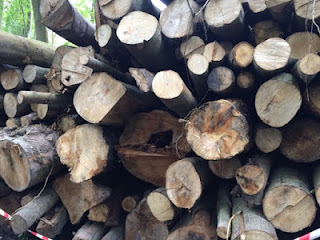 For the more logically minded readers I also wrote a post over on my Purchasing Coach blog at that time exploring the molehills we're actually making a mountain of. Today I'd like to explore one of these tools as it relates to the title of the book. To get the most from this exploration it would be useful to choose a situation you'd like more clarity or insight about. A situation where the saying I can't see the wood for the trees rings true for you. A situation that you might be feeling a little stuck about. For those not familiar with the saying you may recognise can't see the woods for the trees, or even can't see the forest for the trees. 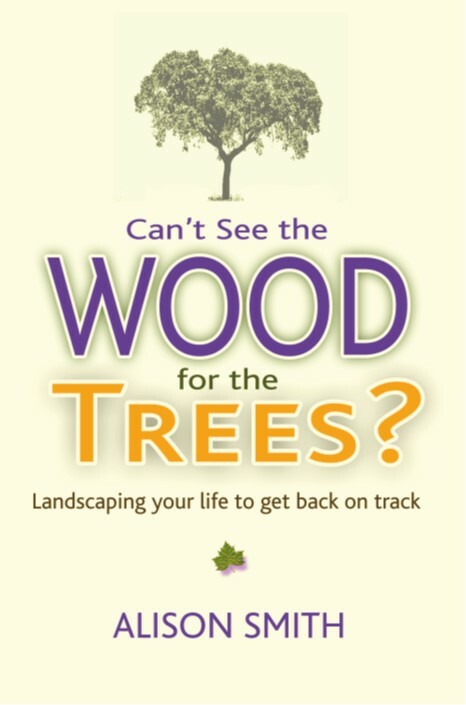 This tool involves putting the current situation to the back of your mind and considering what you would do in reality if you were in a wood/woods/forest and couldn't see it for the trees. Imagine for a moment that you have gone for a walk and found yourself surrounded by trees and are unsure where to go next - what would you do? 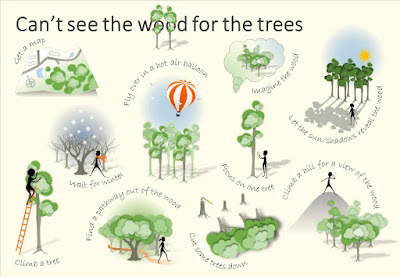 For example, you might get a map out, climb a tree, or just follow a path out as show in this short video blog. Or as happened when I took one senior leadership team out for a Landscaping Your Life strategy day, you could ask a warden for assistance. The aim is to write down as many different options that we could do when in the wood - no right or wrong just a lovely long list of options. No jumping back to consider what they might mean in reality - not yet anyway. A long list of every option you can think of. A long list others in the team can think of. You could even consider what role models, anti role models, your favourite character from a book or movie would do. Just aim for as long a list as possible. Writing the list may have already loosened the feeling of being stuck, and solutions of what to do in the current real life situation may already have come to mind. Here's a few options I came up with for when we can't see the wood for the trees - do leave your own suggestions in comments below. That way we can have an ever expanding list we can call upon when stuck at some point in the future. On Ben Fogle's New Lives in the Wild last night on the TV another option became apparent - stay in the woods and live in harmony with it. Once we've got the list it's then about relating it to the current situation ie what would each suggestion for seeing the wood for the trees look like in the real life situation. Whilst I can provide my own examples for you, it is likely that you will take different meaning from the metaphorical solutions. That's why metaphors are so powerful - they're simply patterns, patterns we make sense of. Our patterns may be similar to others' interpretations, and sometimes not. What could getting a map out mean in a real life situation? Last week the Purchasing Coach's post on the benefits of coaching uses maps and journeys as a metaphor for coaching. So you may find additional suggestions there. What could following a path way out of the wood mean? What could climbing a tree mean? How can you get more perspective? What could waiting for winter, and the leaves to fall, mean? Do you have to make a decision or take action now? Can you wait for a better time? What would the perfect conditions be to take action? What could cutting some of the wood back mean? Can you simplify your work? Can you simplify the situation? As I said earlier these are my suggestions today. On another day, when thinking about another situation, I may have noticed other opportunities. As I am sure you did as you read my thoughts. 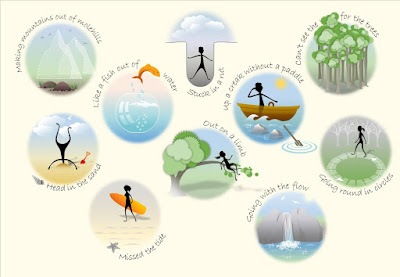 As you reflect on your original situation what solutions or insights have you obtained? What action can you take today to help cement those insights? Can you tell anyone of your commitment to this action? The book has many more suggestions on how to get back on track when any of the above sayings ring true for a situation you're in. They can be used time and time again as every situation is unique, and so too the patterns we take notice of. Which means on one occasion it's obvious we need to cut back some of the branches, and yet on another occasion we realise we need to plant some more trees! I'd love to know how you get on. 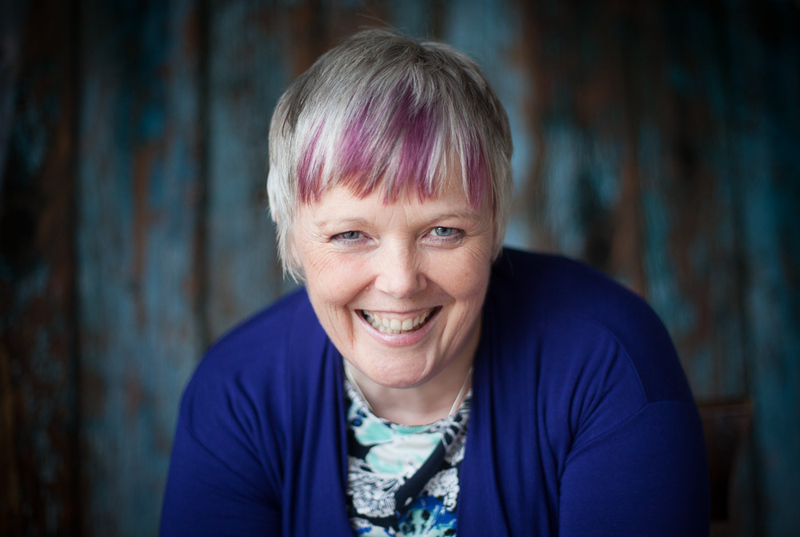 If you're interested in Landscaping Your Life coaching, facilitation, workshops or keynote speaking do drop me an email at alison@alisonsmith.eu, or follow me on LinkedIn, Facebook, YouTube, or Instagram. #LandscapingYourLife will find me too. If you buy the book - firstly thank you - and I'd really appreciate a review / comment once you'd read it. Thank you very much. Can dreams ever become reality?